I started hiking when I was 3 years old (with the parents), but my serious trekking began during a trip to New Zealand in 2005. Since then I've walked trails in NZ (Queen Charlotte, Milford and Tongariro circuit to name a few), the Vikos gorge in Northern Greece, The Pista Altomontana Etnea in Sicily, the Laugavegur in Iceland, and many trails in Israel. I'm an aspiring lightweight hiker, my current base pack weight (not including food, water and fuel) is 8Kg (18 pounds) and dropping. I prefer hiking in cool weather, and use a tent and light sleeping bag combination. Other details: The Barrier dry sacks come in 6 different sizes, (#1 to #6) which are color coded. The bags are made of soft, waterproofed 70 Denier nylon material. 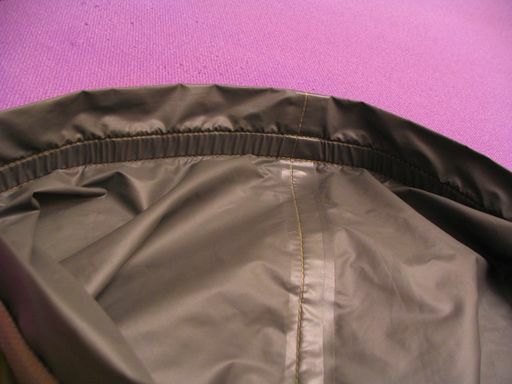 The roll-top closing mechanism consists of a belt of thicker fabric running around the opening, on the outside, about 2 cm (0.8 in) from the top, and a buckle at either end of that belt. 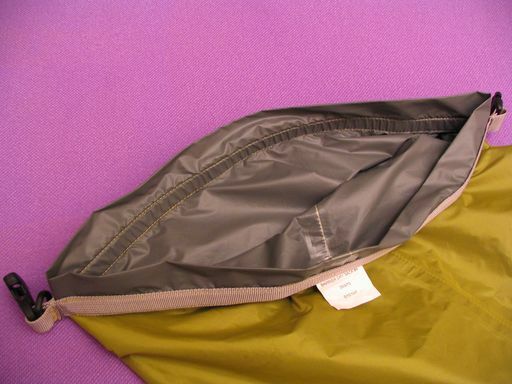 For sealing the sack, as much air as possible has to be squeezed out, the top belt folded over the opening and rolled down (as much as possible, manufacturer says at least three times) and the buckle fastened. I own the #6 (55L, 3364 cu in) and the #4 (28L, 1710 cu in). The #6 holds most of the contents of my 90 Liter (5500 cu in) pack, and the #4 is for my synthetic -4C (25F) sleeping bag (packed dimensions: 13cm (5.1 in) radius, 40 cm (15.8 in) height). These sacks are my only protection, as I use no pack fly, poncho or the like. The Construction appears solid, and I was never worried when pulling and stretching the material in order to pack everything in. All seams but the ones at the top are taped (see image). The first thing I noticed when I first packed the Outdoor Research Barrier dry sacks, is that they are completely airtight. After folding the top edges a couple of times, whatever air is left inside, stays inside. There is no valve, so they require quite a lot of squeezing before they can be sealed. This squeeze-seal took a bit of practice until I was satisfied, but from then on, it only takes a matter of seconds, although there is always some air left inside. One thing the sacks are not good for is compression. Because they are air tight, when stuffing my sleeping bag into the #4 sack, it's quite hard to get the air trapped at the bottom before sealing the sack. 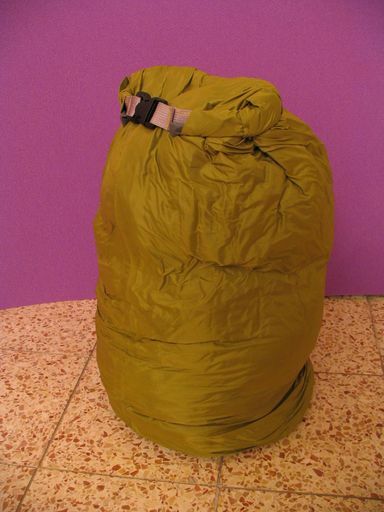 This means that it is much better to first pack the sleeping bag in a stuff sack, compress, and only then place the stuff sack into the Barrier sack and seal. Of course, this means carrying two items instead of one. My testing of the sacks began at home, when I filled the #4 with towels, sealed it, and placed it in a bucket of water for 30 minutes, with a weight on top to make sure it was at least 50% submerged. No water seeped in, but that was no surprise, because it was obvious that no air had seeped in either, the vacuum still held. As for field use, I have taken my Outdoor Research Barrier Dry Sacks on a couple of hikes. The first was the Laugavegur Trail in southern Iceland. On two of the 4 days I encountered heavy rainfall. The minimum temperature we had (not while in the huts) was around 2C (36F). The walk included crossing some rivers and streams. In one or two of these crossings, the bottom part of the pack (in which my sleeping bag is stored) was submerged in the water. As a result, the dry sack was wet on the outside when I checked it later that day, but there was no noticeable moisture on the inside. The second trip was to the Zagori region in northern Greece. The walk was again 4 days long, during which 1 was rainy. In this case, by the time I arrived at the hut everything inside my pack that wasn't inside the dry sacks was clammy to the touch. Again, there was no moisture inside the sacks. In all cases, even though the sacks were wet on the outside, the vacuum was still there, and no water found its way inside. During all of the walking days, both Outdoor Research Barrier Dry Sacks were kept sealed in my pack for 6-10 hours at a time. Just to satisfy my curiosity when writing this report, I've been conducting experiment to see how long they can remain sealed up without air seeping in, and how dry they remain after being used in the field. When there is not much equipment in the sacks and I roll the top at least 6-7 times, the #4 manages to keep a reasonable vacuum for around 3 days, the #6 for around 24 hours. When rolling only 3 times (as manufacturer advises), the vacuum holds for much less, an average of around 30 minutes for both bags. I also repeated the bathtub experiment. This time, placing heavy objects inside the sacks. After around 20 minutes, there were a few drops of water inside, at the points where the objects placed inside came in contact with the tub floor. I also left the sack floating all night in bucket of water (without any contact with the bucket), and in the morning there was very little moisture inside. one thing that did surprise me was that there was some bleeding of the color of the sack into the water. After some use, they are still able to provide adequate protection from rain and the occasional river dip. The seams seem to hold very nicely (bear in mind that the vacuum placed quite a lot of pressure on the seams), and the taped seems are all still intact. 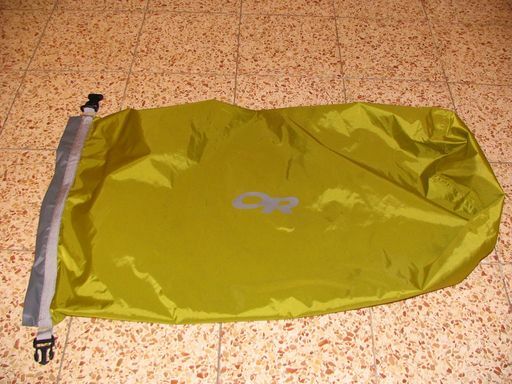 The Outdoor Research Barrier Dry Sacks are a simple, lightweight option for protecting your gear. I quickly learned I never have to worry about the inside of my pack (and most importantly, my sleeping bag) getting wet, even when part of the pack was underwater. Although they are not perfect, the protection to price and weight ratio is quite appealing. One important thing to point out is the need to squeeze out as much air as possible before sealing the sacks. This is due to two things: the first is that you don't want extra air inside your pack, because it takes up space. The second, more important point is that an inflated air tight sack is more easily punctured or popped. This takes a bit of practice, but seems to me is a small price to pay for the added protection these sacks offer.